We also found a group f rather dried up earthstars, Geastrum pectinatum, at their usual spot beneath a row of conifers. Eleven members turned up on a cold, crisp morning to what is a usually productive site. However, dry, frosty weather had brought an end to the fruiting season. Only 25 species were recorded. Today, courtesy of the National Trust, our group of fourteen met at Wydcombe Manor to look for fungi in the woods. It had been quite dry and we strugled to find many macro fungi, apart from those growing on dead wood but neverless, we made some interesting finds starting with a Hare’s-ear, Otidea alutacea, found by Jillie. We found good specimens of Jew’s or Jelly Ear, Auricularia auricula-judae on elder (below) and Cramp balls, Daldinia concentrica, on ash (below). Growing on sycamore, we saw Dead Moll’s Fingers, Xylaria longipes (below). Hypoxylon howeanum, growing on hazel, was surprisingly, a new record for the Island. 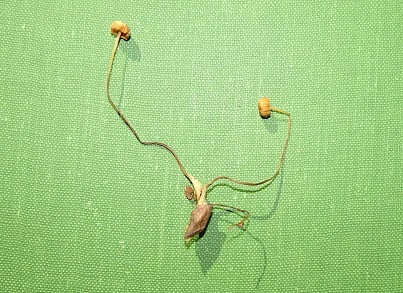 An interesting find was Fenugreek Stalk-ball, Phleogena faginea (below) growing on ash. In total we recorded 41 species Wydcombe Manor fungi 5.11.17 Many thanks to Ben for providing the pictures. Our group of eleven met up in the carpark of the Westbrook Centre, where Jo, the director, had kindly given us permission to visit. We were met by Jason, Ecology & Conservation Manager, who made sure that we all signed in at the start. The site proved to be extremely productive for fungi and we were able to identify 69 species, many of them fungi which we do not often encounter. First of all we went back down the road to look at a bracket fungus growing at the base of an old ash tree which Jackie had noticed whilst walking here. This proved to be Perennipora fraxinea (right below), a species for which we have only three previous records. Other interesting finds included the white Crested Coral Fungus, Clavulina coralloides (left below) and the little Brown Cup fungus, Rustroemia firma (a close relative of the cup fungus, Lanzia echinophila which we found at Sainham Copse on 27th August) middle below. Perhaps most spectacular was a ring of the giant Trooping Funnel, Clitocybe geotropa found by Dave (right below). One mystery fungus was growing parasitically on a Clouded Funnel, Clitocybe nebularis (see below). We are still attempting to get this identified. A party of 19 of us met up in the carpark at the Medina Valley Centre and began by looking at the fungi growing on the lawn around the birch trees. We then moved on along the cycleway into Dickson’s Copse, where we found plenty of fungi to keep us occupied. In particular, we were impressed by the quantities and size of some of the Hebeloma species. We also found a large specimen of Phellinus pomaceus growing on a blackthorn branch. In total, we identified 59 species. In the afternoon we were joined by others and spent the time looking at the material we had collected under the microscope. Another impromptu foray, taking advantage of the excellent early growing conditions for fungi. Once again we found a good selection of fungi. Highlights included finding the bolete, Xerocomus parasiticus which grows parasitically, attached to earthballs, Scleroderma. Particularly exciting was a find made by George whilst photographing a small fungus. He noticed a group of cup fungi growing from the decaying husk of a sweet chestnut fruit. This was Lanzia (Rustroemia) echinophila, an infrequently found fungus which is specific to sweet chestnut. This was the first occurrence of it recorded from the Island! Altogether, we recorded 44 different species. The cup fungus, Lanzia echinophila, new to the Island. The warm wet weather throughout July and into August has provided ideal conditions for fungi and so Colin, Jillie, Jackie, Dave, Selena & Natalie took part in an impromptu early foray in August. We were delighted to find lots of fruiting fungi, especially Russulas and Boletes, and we recorded 36 different fungi during the morning. Some of these were early fruiting fungi which we do not often see. 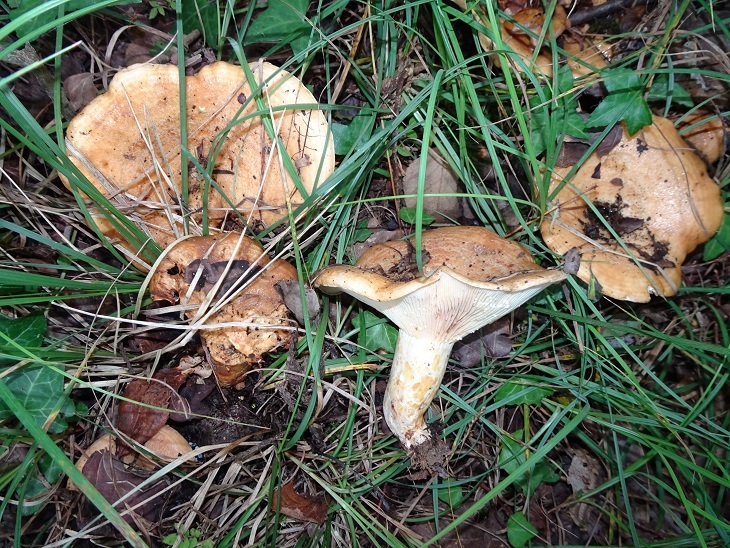 There had been very few previous records of the large Zoned Milkcap, Lactarius zonarius (left below) and the little Marasmius growing on oak leaves, Marasmius quercophilus (right below). 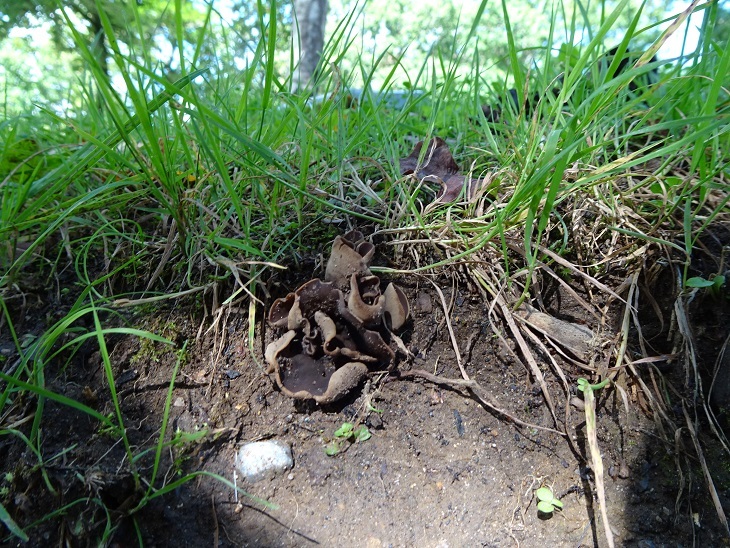 As we explored the carpark, we found the cupfungus Toad’s Ear, Otidea bufonia, not previously recorded from the Island (below).